On Saturday night, it was time for one of my favourite events in any year. 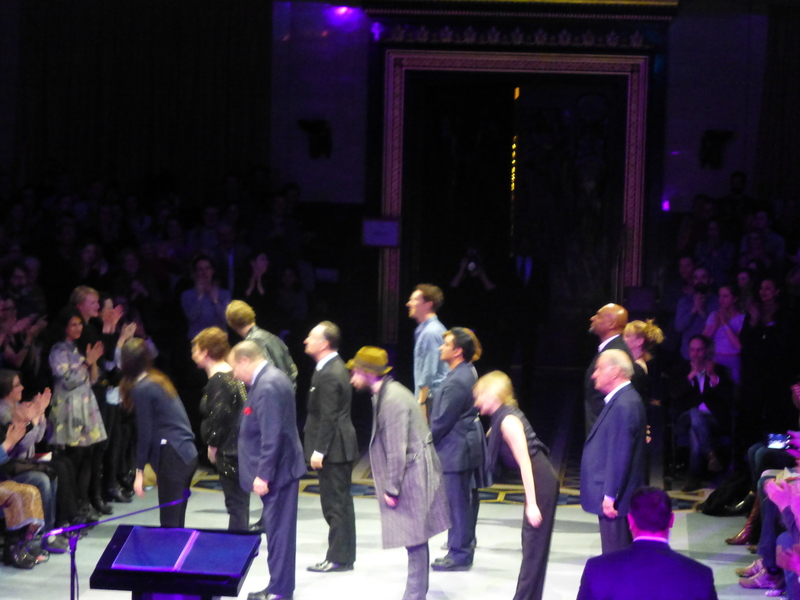 It was another trip to Letters Live, which I first discovered after missing the very first event at the Tabernacle and since missing that, I’ve been determined to go to at least one night of any Letters Live run in London since. This weekend’s performances took place at Union Chapel in Islington, which is a wonderful venue and an ideal setting for Letters Live. For those unfamiliar with Letters Live, it is an evening that celebrates the power and beauty of the written word, through the reading of letters from throughout history, whether from the 1800s or 2017. Some were incredibly funny and some were deeply poignant, delivered by another set of talented actors and writers. You never know what letters will be read and you can never be sure which celebrities will be reading on any given night. This all adds to the magic and excitement of the occasion and keeps the focus on the letters and not the people reading them. Letters Live also supports some wonderful charities (you can learn more on the website) and encourages all of us to think about writing more, in a world where technology has taken away from the simple, yet powerful act of putting pen to paper. Last night’s performers were: Amanda Abbington, John Simm, Rob Rinder, Zawe Ashton, Nick Moran, Lemn Sissay, Alan Carr, Ashley Walters and with musical interludes from the singer Izzie Yardley. What were my favourites tonight? This is always a tough question, but Alan Carr read some particularly brilliant letters and was hilarious throughout the night. His letters included a complaint from a airline passenger on his dreadful seat (“Seat 29E”) (read it here), a letter from Kenneth Williams to a fan and the response to the Turkish Sultan from the Zaporozhian Cossacks. I also loved Harold Pinter’s brilliant response to a letter from a theatregoer concerning the play The Birthday Party (the initial letter read by Amanda Abbington and Pinter’s response by John Simm), a surreal letter from Jack Lemmon to Walter Matthau regarding investment in a cat farm (also read by Simm) and a college student’s rejection of his Harvard rejection letter (read by Ashley Walters) (read it here). Hunter S. Thompson’s letter of advice to his friend was also a thought-provoking letter, particularly towards the end (read by Simm, you can read it here). On the other end of the emotional spectrum was Rob Rinder’s reading of “Sleep Well My Love,” a letter by an American WWII veteran Brian Keith to Dave, a fellow soldier he met and fell in love with in 1943 in North Africa. It was written on the anniversary of their first meeting. Sadly Dave never made it home. It was a particularly moving reading from Rinder, as Saturday night also marked the four year anniversary of his marriage to his husband. Letters Live also always chooses wonderful musical acts (previous nights have included Tom Odell and it was at Letters Live last year where I discovered Rag N Bone Man) and last night’s act Izzie Yardley was another performer whose music I will be looking out for following this event. I particularly loved her opening song, By Your Side (check it out on Sound Cloud here). As I have done with previous Letters Live nights, below is a full list of last night’s letters and music. I would add that last night there was no screen showing us the details of the letters and so I have compiled this list based on the notes I made from the introduction to each letter and some follow up research on the internet to ensure that I have all the names set out correctly! I’ve also included links to some of the letters throughout this article if I have been able to find them (some from the Letters Live website itself). In fact, my only criticism of Letters Live is that they don’t give out a list of the letters read. I’m all for the surprise of the night, but they could still hand something out as everyone is leaving (we were given something at the Southbank Centre event a few years ago). Until then, my pen and paper will have to do! For news and information visit Letters Live’s website, or for more lovely letters visit the Letters of Note website. The brilliant books that have inspired these events: Letters of Note, More Letters of Note and To The Letter are available through the usual stockists. Today is National Poetry Day and seeing this online today I thought I’d post it here. 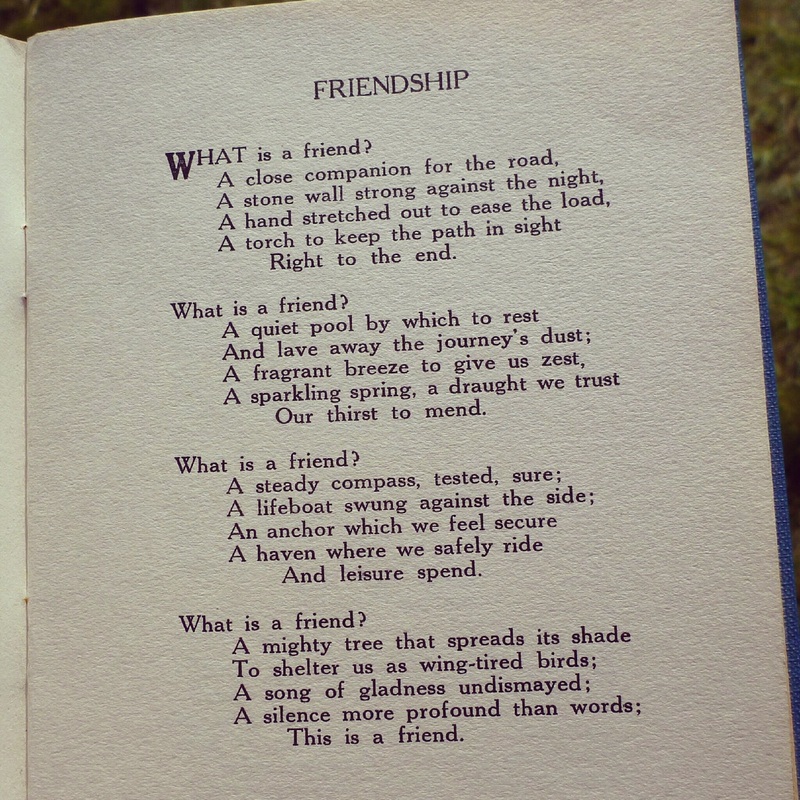 Posted on October 8, 2015 Categories Literary eventsTags Friendship, National Poetry Day, PoetryLeave a comment on Happy National Poetry Day! In December 2013, I was incredibly frustrated to learn I had missed an event featuring two of my favourite actors (Benedict Cumberbatch & Gillian Anderson). 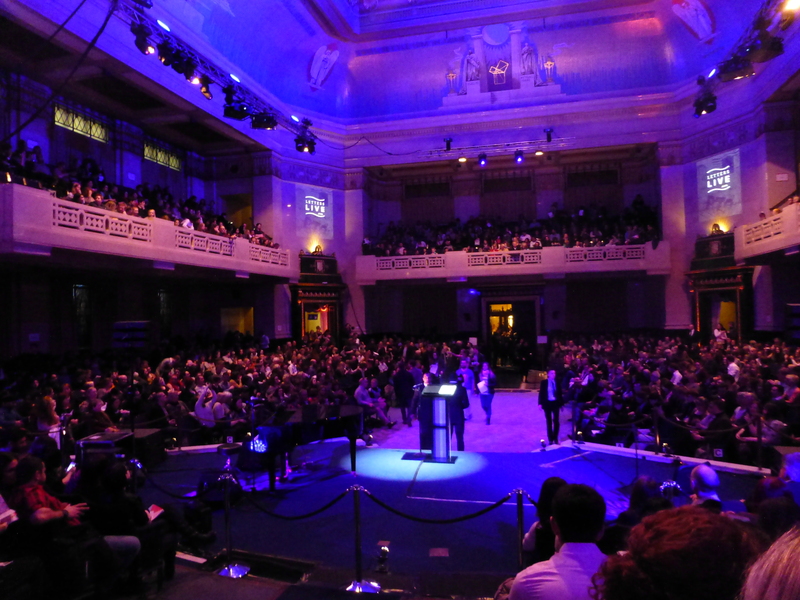 That event was the first Letters Live at the Tabernacle in London. However, due to their high profiles, it meant that the event was then on my radar for any future shows, the first of which arrived on World Book Day 2014 at the Southbank Centre and what a thrilling experience it was, as I wrote about on my blog at the time. For those not familiar with Letters Live, the event is a celebration of the enduring power of the written word and letter writing, through the reading aloud of correspondence across the decades from both well known figures and ordinary individuals leading their lives, captured by authors Simon Garfield and Shaun Usher through their respective books To The Letter and Letters of Note, both published by Canongate Books . It’s an incredible insight in to our history and certain historical events, but also a wonderful way to simply explore the intricate fabric of human emotions, whether love, friendship, anger or humour, all of which seem so much more poignant and powerful in the form of a letter, especially in an age in which so much of our communication with one another is via short text messages, tweets or emails, often lacking in a depth of emotion. After the success of previous Letters Live events, this week has seen a huge undertaking by its organisers, in conjunction with publisher Canongate Books, as rather than a one off night, there will have been four unique evenings, during which a variety of incredible letters will have been read from some of the finest actors and writers we have (sadly Wednesday’s event was cancelled otherwise it would have been five nights). Adding to the thrill of each evening, the letters to be read and their readers (with the exception of Benedict Cumberbatch and Louise Brealey) have been a surprise for the audience. Last night’s penultimate evening was the only one I could attend (I’d have been at them all if I could!) and so I made my way to the Freemason’s Hall in Covent Garden, perhaps best known to the British public as being the external location of the MI5 office in Spooks! Not normally open to the public, other than for special events, it was certainly a beautiful building to admire while waiting for the show to start. The venue was packed and the atmosphere was certainly one of excitement and anticipation. As for the event itself, it was a wonderful evening and rather emotional. Tonight’s line up comprised of: singer Tom Odell, Geoffrey Palmer, Benedict Cumberbatch, Gemma Chan, Colin Salmon, Samantha Bond, Louise Brealey, Sanjeev Bhaskar, Joanne Froggatt, Tom Sturridge, Olivia Colman, author Andrew O’Hagan and cellist Natalie Clein. I have listed the full programme of letters at the end for anyone interested, but wanted to draw out some of my highlights of the thirty heard. The only minor gripe I had (and it is a minor one) was that the block of seats we were in, were behind the lectern, meaning we didn’t get to see any of the facial expressions of the readers, with the exception of Benedict Cumberbatch, who each time he read, at some point angled himself briefly for the benefit of those behind him. As these weren’t the cheapest seats, it seemed to be a point that should have perhaps been made clear on the seating plan when booking. Each half began with the supremely talented Tom Odell, whose voice carries so much passion and emotion as he plays the piano. It was a lovely touch to add music to the event and each song played by Tom had a link to the writing of letters, setting the tone perfectly. He also ended the event with the song “I’m gonna sit right down and write myself a letter” by Fats Weller, which brought the evening to a wonderfully poignant and moving end. Personally, certain readings had a greater impact on me than others, whether due to the subject or the circumstances in which they had been written. Some were funny, others affectionate, some sarcastic and others angry, highlighting the breadth of our emotions. One of the most powerful was a letter read by Benedict Cumberbatch, written in 1935 by Lion Feuchtwanger, a German Jewish novelist who had escaped Nazi Germany to live abroad and whose home had been given away by the Third Reich, while still requiring him to make payments on it. His letter, “To the Occupant” was written to whoever now occupied his beloved home and through his writing we feel his pain, anger and contempt for the Third Reich and those supporters who reaped the benefits of the dreadful treatment of others. I can’t help but wonder how such a letter has survived and was not destroyed at the time, making me wonder about the person who must have received it. Tom Sturridge was also incredible to watch, as he filled his readings with as much emotion as possible and seemed to truly become the people on the page and his reading of Henry James’s letter to his close friend Grace Norton in 1883, trying to bring her hope and support, as she suffered from what was likely depression following a bereavement, was very special. Following his moving portrayal of Alan Turing in The Imitation Game, Benedict Cumberbatch also read a brief letter from Turing to the mother of his school friend Christopher Morcon after his death and his poignant request for a picture so that he could remember his face was all the more powerful after seeing the film. There were of course lighter moments in the evening, including the hilarious letter written by Elvis fans to President Eisenhower, begging them not to cut his hair or side burns in the Army! Olivia Colman delivered it brilliantly (including apologising for using a Deep South accent, as she did not know what people from Montana would sound like)! Samantha Bond also read three short online responses from Tina Fey to internet commentators. Her wit and sarcasm in response to some of the nasty comments made about her were brilliant. The oldest letter, written in 856 AD, also read by Olivia Colman, was a standard form response letter from the ‘Dunhuang Bureau of Etiquette’ in China, which insisted that local officials use the letter template when sending apologies to offended dinner hosts if they had embarrassed themselves at an event! It was also wonderful to hear Geoffrey Palmer read his two funny anecdotes, including a blunt response from Private Eye to representatives of someone who felt the magazine owed him an apology and damages. There was also a rather magical moment, as Louise Brealey read a letter by Beatrix Potter to a five year-old boy from 1893, which marked the creation of Peter Rabbit, his siblings and Mr McGregor’s garden. Looking back on this short and sweet letter, sent to entertain a young child, knowing how much magic that little rabbit and the world of Beatrix Potter would create for so many children for years to come, was gorgeous. Lastly, I couldn’t reflect on the evening without touching on what I assume will always be a highlight of Letters Live events for me and that is the love story of Chris Barker and Bessie Moore, who began writing to each other during the Second World War and who fell in love through their letters and went on to marry and remain happily together for the rest of their lives. Their letters, read as if a conversation between two people, were a highlight of my last Letters Live. Capturing the hearts of many who have heard them, this year also marked the publication of a book of just these letters – My Dear Bessie, for which I attended a launch event attended by their sons. Louise Brealey read Bessie at both of these events and it was lovely to see her do so again last night, together with Benedict Cumberbatch reading Chris. The two have such a perfect chemistry and were able to bring to life the romance, beauty, love, concern and silliness captured in their letters over the war. Their words, written in such a different time, but so filled with emotion that we perhaps express to each other less easily now, never fail to bring a tear to my eye and tonight was no different (and I saw many others in the audience wiping away a tear too). 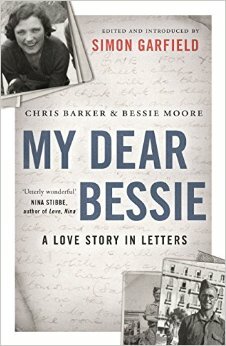 I reviewed My Dear Bessie on this blog here and I cannot recommend it highly enough, whether you’ve been to a Letters Live or not. All of those participating in Letters Live bring their talent to the material, but ultimately what makes these events so special is that it isn’t about those reading, it’s about the power and emotion of the words, some of which were written hundreds of years ago and yet which, when brought to life from the page, still have the ability to capture the imaginations and hearts of those hearing them. I am so pleased Letters Live has become the success that it has, guaranteeing that these events will continue, drawing a new audience and reminding us of the power of words. Jamie Bing of Canongate Books began last night by saying that “Letters throw light wherever they are cast.” That certainly proved to be the case in the Freemason’s Hall this week and I’ve no doubt tonight’s final show and future events will continue to do the same. Those behind Letters Live hope it will continue to promote the importance of literacy as well as being “one of the most powerful ways in which the joy and pain and humour and tragedy of being human can be shared.” I certainly think they’ve succeeded and created something truly special and if it also helps to inspire its audiences to delete their short text or 140 character tweet and put pen to paper in order to make a connection to those in their lives, then that too is something that should certainly be celebrated. 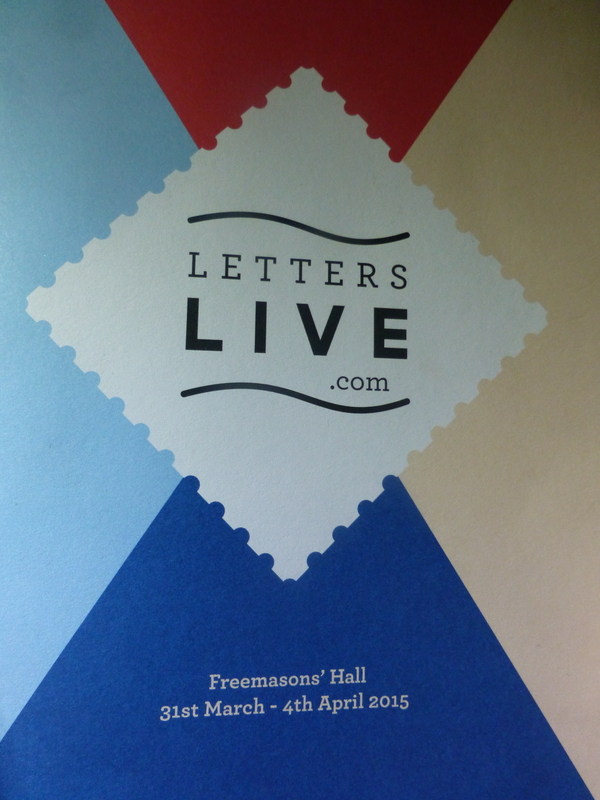 For information about ticket availability for tonight’s Letters Live and future events visit the Letters Live website. Simon Garfield’s To The Letter and Shaun Usher’s Letters of Note Vol. 1 are published by Canongate Books and available through all the usual stockists. Volume 2 will be published later this year and details can be found on the Letters of Note blog, which also contains some of the above letters.